As January draws to a close, it's time for a celebration of the month's lovely birthstone, the rich and wonderful garnet. 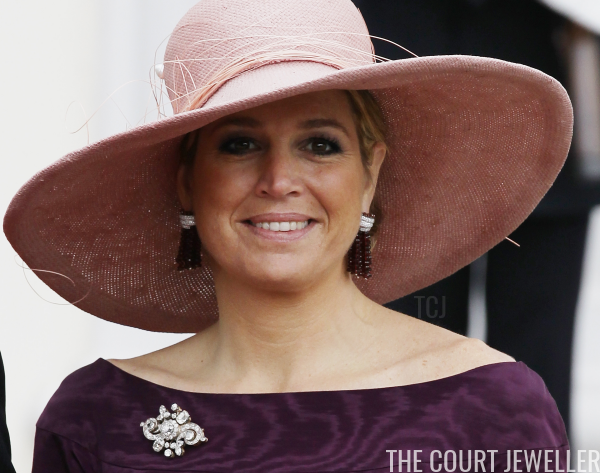 Our spotlight today shines on the garnet and diamond tassel earrings worn by Queen Maxima of the Netherlands. Maxima's earrings are both bold and simple in design. They feature numerous disc-like gemstone beads. The luminosity and color of the stones indicate that the beads are most likely small garnets. The garnet beads are strung together to form strands, which are gathered into a tassel-shape by a trio of pave-set diamond bands. The earrings have been in Maxima's jewelry box for a number of years. 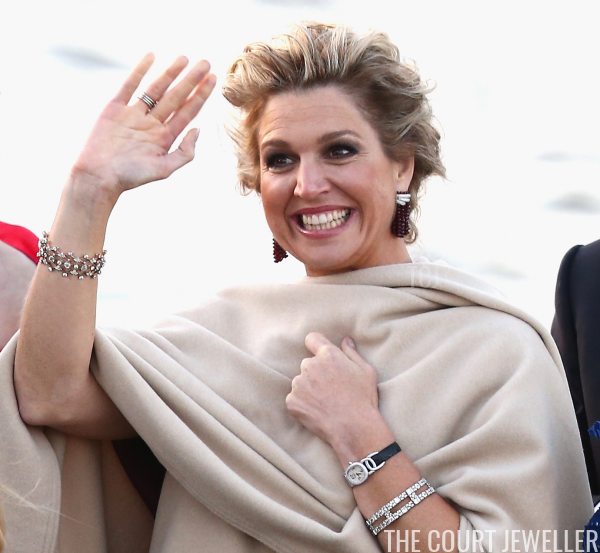 She began wearing them when she was still Princess Maxima. Above, during a visit to Germany in 2011, she pairs them with a diamond scroll brooch that belonged to Queen Wilhelmina. Maxima often wears the earrings with her favorite dramatic picture hats, and they do provide a pleasant extra bit of visual weight with the angled chapeaux. She often wears the earrings with clothing in various shades of pink, including dark berry and blush. 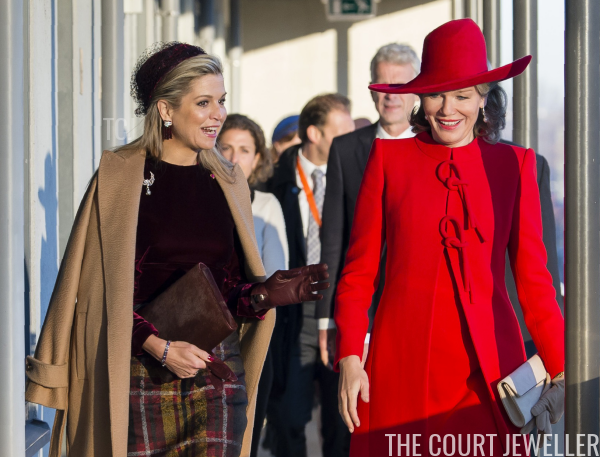 Here, the earrings are part of a monochrome look with a wine-colored coat and matching hat, worn during a visit from the President and First Lady of Argentina in 2017. 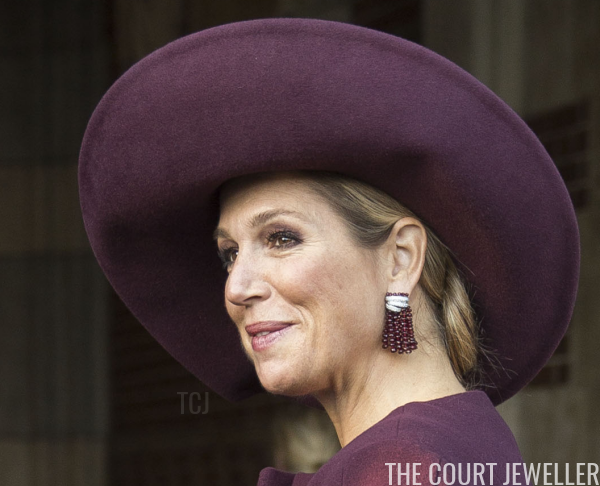 And here, the earrings coordinate with the dark berry-colored velvet portion of her ensemble, worn during a state visit from King Philippe and Queen Mathilde of the Belgians. 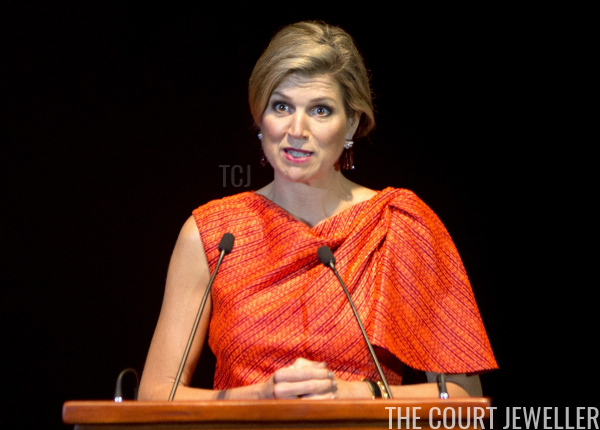 But occasionally, Maxima uses the earrings for contrast, as she did with this orange ensemble in the Philippines in 2015. The earrings are substantial and glittering enough to be worn with formal wear as well as more casual ensembles. 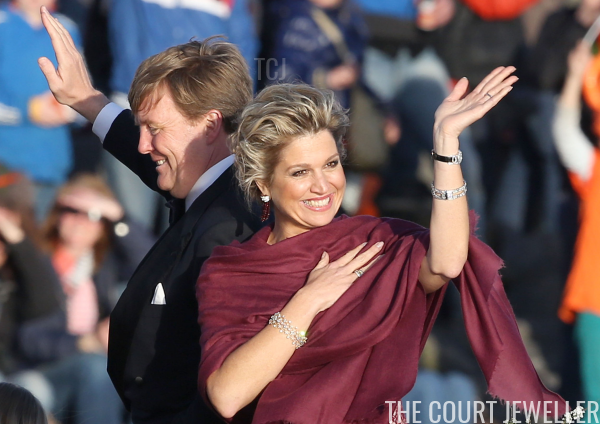 One of my very favorite appearances of the earrings came on Prinsjesdag in 2015, when Maxima wore them with a stunning gown by Jan Taminiau. The delicate embroidery on the dress was inspired by the Japanese room at the Huis ten Bosch Palace. 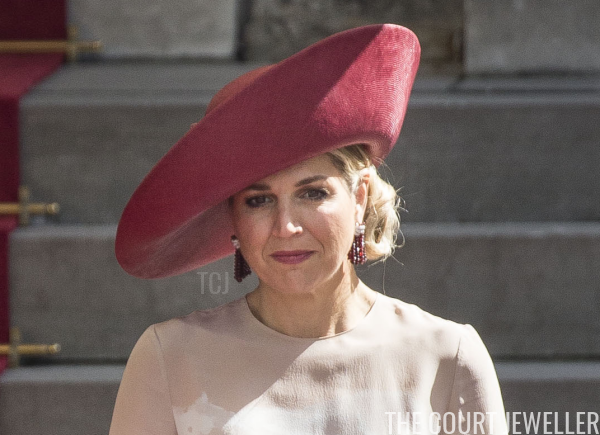 Maxima also wore the earrings on one of the most important days of her life: the inauguration of her husband, King Willem-Alexander, as monarch. She chose the earrings for the water pageant held in the evening after the inauguration ceremonies, pairing them with diamonds from the family vaults.